So, this week I’m doing another theme week, shocking I know. If you’ve been a fan of my blog for a while you know that I like to match up my releases sometimes. The burger week or the cupcake week, for instance, was me just being a goofball but I like having things match sometimes! And that brings me to this week’s releases, the Dancing Sheep Duo (Applique and Earrings) and the new Sheila Sheep Slipper-Socks pattern. I’m on a bit of a slipper kick, I’ve designed 3 this year and I’ve got more ideas going! I hope you’re liking them too. I don’t know why I’m in such a mood to design slipper-socks but I am, maybe it’s because my feet are always cold. Who knows? Either way, I hope you like all the new designs this week and give them a try! 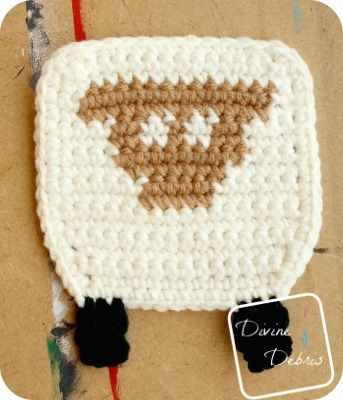 You can purchase an ad-free downloadable pdf from my Ravelry shop for this pattern. Both patterns are worked flat, in rows back and forth, with a turn at the end/ beginning. The last row is a border around the whole finished piece. All of the stitches in this pattern are single crochets, because of this the directions (where all the color changes are) only tells you how many stitches to do in what color, this is what the number in the parentheses means. Earrings: Color A is white, and color B is black. 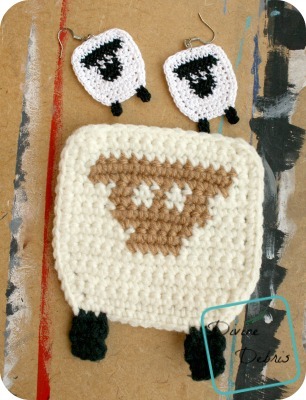 Applique: Color A is white, color B is both brown and black. Please note there are portions of the patterns written as I write my tapestry designs. All the stitches in both designs are single crochets, so in the tapestry rows the instructions only tell you how many stitches (this is the number in the parentheses) to do in what color. The earrings measurements do not include the findings. Once you get all your ends woven in, lay the sheep flat and coat them in fabric stiffener. Once they’re nice and coated, let ’em air dry. Once they’re dry, secure your findings to them as you’d like (the ch-1 spaces at the corners or the center as I have made here). I always use fabric stiffener when I make earrings because it helps ’em keep their shape. Flip the whole piece around so you’re working along the bottom of the piece. And there they are! 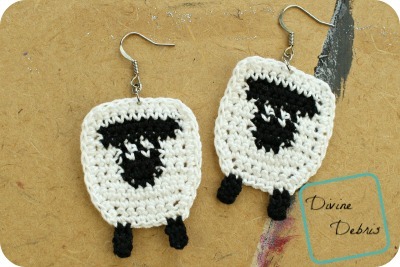 I hope you like these littlest of sheep. 😀 See ya next week. Who’s Up For Stuffed Crust?